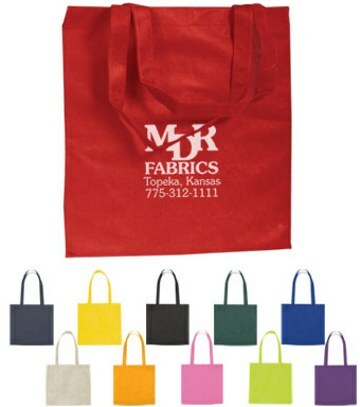 Cheap Personalized Non-Woven Shopping Totes in Bulk. Promotional, Lowest prices in America. On Sale Today: See the Price Table below. Pink, Lime Green, Purple, Orange, Ivory White, Black, Red, Forest Green, Navy Blue, Yellow, Royal Blue. Low cost wholesale shopping tote bags, 15" x 16", light but resistant, with 24" handles. Our wholesale personalized tote bags are made of 110 Gram, Non-Woven, Coated, Water Resistant Polypropylene, with the feel of cotton fabric. The very top of the line for non-woven totes: please note that our gift tote is 50% stronger than most other non-woven totes; typical material for non-woven totes is only 75-gram polypropylene. We supply both bulk personalized totes and bulk blank (not imprinted) tote bags. Budget Prices in the USA and Canada for bulk personalized non-woven totes. Free artwork design. We will send you a proof for your approval before production. American clients pay no taxes. High impact advertising at competitive pricing to fit all budgets.